Plans for Dublin’s College Green and Dame Street, which include a pedestrian plaza outside the old Irish parliament building, includes the continued mixing of buses and bicycles, planning files have confirmed. Stakeholders from local and national government bodies including Dublin City Council, the National Transport Authority and Transport Infrastructure Ireland were involved in drawing up the plans and, on Monday, councillors from the South East area will be asked to approve plans for Part 8 public consultation. Changes to the area are progressing because of the Luas Cross City tram project, but elected councillors are only now to be asked to review the street layout plans — when tram tracks are starting to be placed on nearby street. People traveling by bicycle from College Green southbound into Dame Street westbound will be worst affected by continued sharing with buses and conflicts with a taxi rank / loading bay. One of the main sections of mixing with buses is a turning lane from College Green into Dame Street — on this lane, which will be between tram tracks, people on bicycles will have to “take the lane” and cross over tram tracks as buses try to do the same thing. A large section of Dame Street westbound will also be shared between buses and bicycles. There would overall be large improvements in the size of footpaths but some key constrained and congested footpaths will not be improved, such as the pinch point at College Green between the Bank of Ireland and Trinity College, and at the junction of Dame Street and South Great George’s Street. Councillor Ciarán Cuffe (Green Party), the chairman of the council’s traffic and transport committee, is calling on fellow councillors to reject the scheme as proposed. 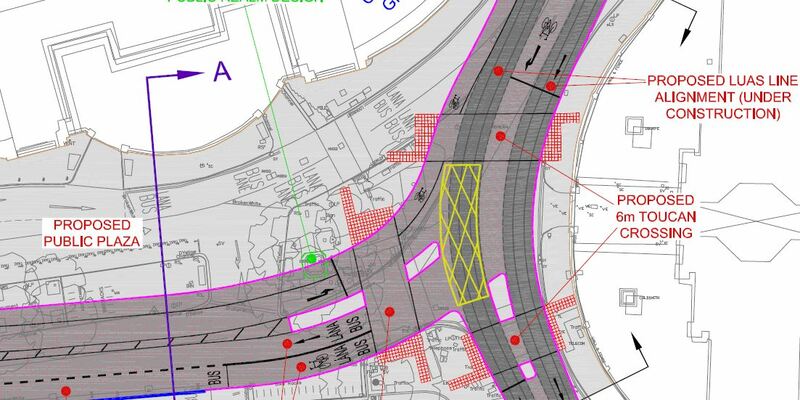 According to Cuffe, the drawings are inappropriate for the following reasons: the road geometry will facilitate fast-moving vehicular traffic; the central median and ghost island reduce the pedestrianised area on the north side of College Green; the westbound cycle facilities appear inadequate; the focus on yellow boxes and tactile paving may be inappropriate for the historic context of this area and interfere with heritage elements; and there’s a failure to consider the recommendations of the Design Manual for Urban Streets and Roads. Included in the Part 8 scheme as planned includes reversing the flow side streets south of Dame Street, namely Church Lane, Trinity Street and part of Andrew Street. A consultant’s study shows that there’s demand for cycling contra-flow northbound on the section of St Andrew Street south of Trinity Street, but that part of St Andrew Street is excluded from the Part 8 and there’s no sign of contra-flow provision at the junction. @Mike Do you know whether the Road Safety Audits re cycling are actually carried out or not, and if they are, are they FOI-able? We really need to start getting Dublin Bus buses out of this area and start to cull those open-top tourist buses. With this proposal I am seeing a lot of road graffiti (sorry, road markings) no red surfacing on cycle tracks and sadly, uninspiring urban design. We are still depressingly such a long way from the dutch model of cycle facility design. Not sure what is going on with the Toucan Crossings. Providing extensive median hatching is unacceptable in this location: redundant road space should be hard or soft landscaped. And it top if off, it looks like they are removing one of Dublin’s few contra-flow cycle tracks on St. Andrew Street. Cycle infrastructure a complete afterthought as usual. College Green will be the same death trap for cyclists dominated by Dublin Bus. Why does Ireland have to keep copying the flawed British model of cycle infrastructure? Nobody in government has the balls to do anything radical or remotely different to mummy Britain. Let’s look to Denmark and NL for a change please. How many in DCC or the NTA actually cycle to work? I’m guessing not even 2%. The road planners and motorists have a chokehold on this city. To get a ‘a world class public space’, you need world class urban architects and not some engineers focusing on vehicular traffic first and everything else second (if that). The only way to get ‘a world class public space’ is to hold a competition with international participants. I can’t understand the apparent lack of input from design professionals, architects or otherwise. This public space absolutely calls for an international competition. It’s far too important to rely on members of the DCC. @Andrew — not sure exactly when you wrote your comment but the article was updated a few times as the meeting was happening and now includes reference to international competition/ tender which is to be run for the plaza area.